Very roomy clipper style boat perfect for taking the family out on the lake. She has a very reliable and economical 120 hp Ford Lehman engine that will run all day without causing pain in the hip pocket. The wide walk-around decks make getting around so easy and are very safe for the kids. The dining table comfortably seats 6 and the there is plenty of room upstaris for an outdoor setting. The V berth is very roomy with additional bench bunks in the saloon. 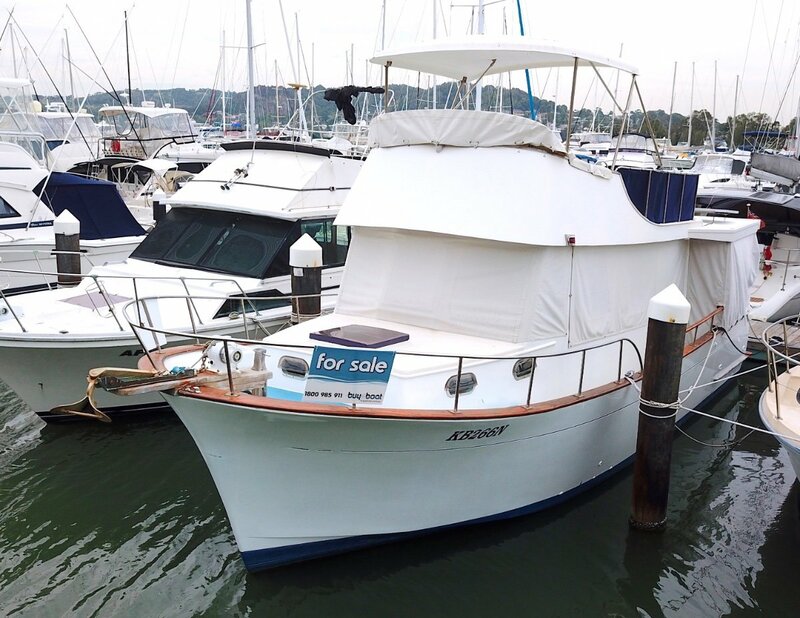 This boat has everything you need for a weekend on the water, including hot and cold shower, electric toilet, kitchen with gas cooktop and stove, fridge and stainless sink, as well as lots of bench space. The new 2 KVA portable generator gives you hotwater while at anchor, as well as supplying 240v power. The boat comes with a fully serviced mooring in Bonnels Bay and a 2.6m fibreglass tender with oars to get out to the boat. This boat has had lots of money spent on refitting and maintaining her great classic look and feel, including extensive hull and engine upgrades (receipts supplied). She has just been antifouled and had propspeed applied so she is ready to go and explore the lake. She is the perfect way to get the family out on the water without spending a fortune on fuel, and has plenty of room to spend extended periods aboard. Maunals for all equipment are provided, as well as the oringinal wiring diagrams from when the boats was first built in 1974. She also comes with a large stock of spare parts. This is a great looking boat for a great price. For more information or to organise an inspection call Sean on 0468601210.